You know those funny “that-would-never-happen-to-me” stories that you hear about? Like when you run in to get coffee for three minutes and you walk out to find your car towed (and your wallet $268 lighter). Or that time you ran the dishwasher with dish soap rather than dish detergent. Or when you back your brand new car into a curb for the eightieth time. Or when you want a liiiiittle bit more salt in your soup and the salt shaker decides to make the excellent decision to dump its entire contents into your precious lentil stew. Nope, those things would never happen to me. Except that they all did. Every last one of them. Allow me to set the scene. The stew was nearly done. I had just added the balsamic vinegar. The apartment smelled like a cute little cottage in the winter, complete with muffins in the oven and soup simmering on the stove. It was picturesque. It was straight out of a souptastical fairy tale. Then, when I proceeded to finish the soup with a touch more salt, the lid came off and fell into the soup along with half the salt shaker. And we’re not talking a little table salt shaker. We’re talking the big mama from Whole Foods. Like would you like some soup with your salt. At first I just stood there, staring. I gave the salt the evil eye for a minute or so, scooped out what I could, gave it a taste, and winced. Then I started cracking up. Because this would happen to me. The good news is that while a cup of salt may ruin the flavor of the stew, it surely doesn’t ruin photographs. So today (since we can’t eat with our mouths), let’s eat with our eyes. Let’s pretend we didn’t spend an hour cooking soup that is now being eaten by the sink drain. Let’s pretend that one sip wouldn’t send your blood pressure through the roof. Let’s pretend that it wouldn’t send a salt stick running for the hills. I swear that this soup tastes amazing. Just go easy on the salt, mmk? 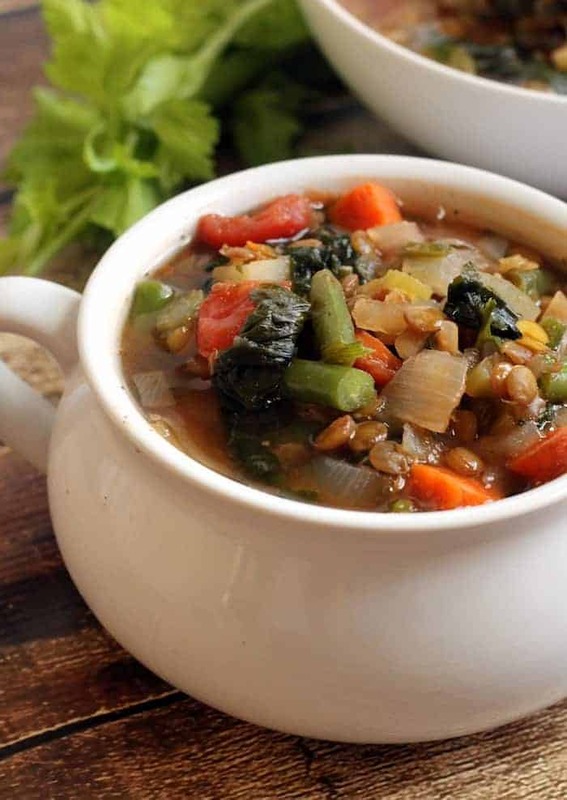 A hearty lentil stew packed with vegetables. Freezer-friendly and perfect for lunch or dinner! Heat oil over medium heat in a large pot or dutch oven. Once oil is hot, add onions, celery, carrots, and a dash of salt. Sautee for about 7 minutes. Add garlic and sautee for another 2 minutes. Stir in the salt, italian seasoning, and bay leaves. Sautee for another minute. Add green beans, vegetable broth, water, tomato paste, diced tomatoes, potato, and lentils. Give it a stir, bring to a boil, then simmer (covered) on low for 35-45 minutes, or until lentils are tender. Stir in spinach and balsamic vinegar. Season with salt and pepper to taste. i am so in love with this bowl full of comfort and deliciousness! I can’t even tell you how many times I’ve dumped the whole salt shaker into something…typically it’s scrambled eggs and there’s just noooo distributing all the salt. You’d think I’d learn, but nooooo. 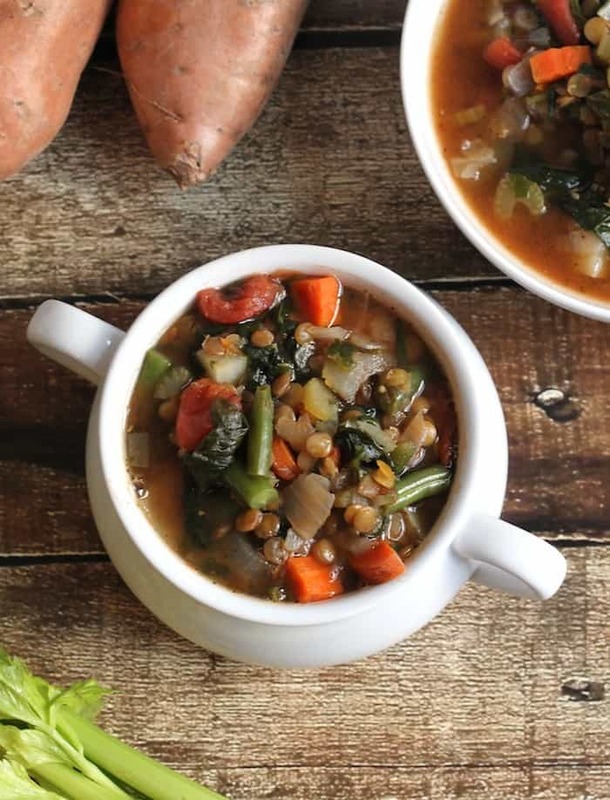 This soup looks absolutely fantastic! I want to make it and have my house smell like a straight up wintery cottage out of a fairy tale! This soup looks fantastic! 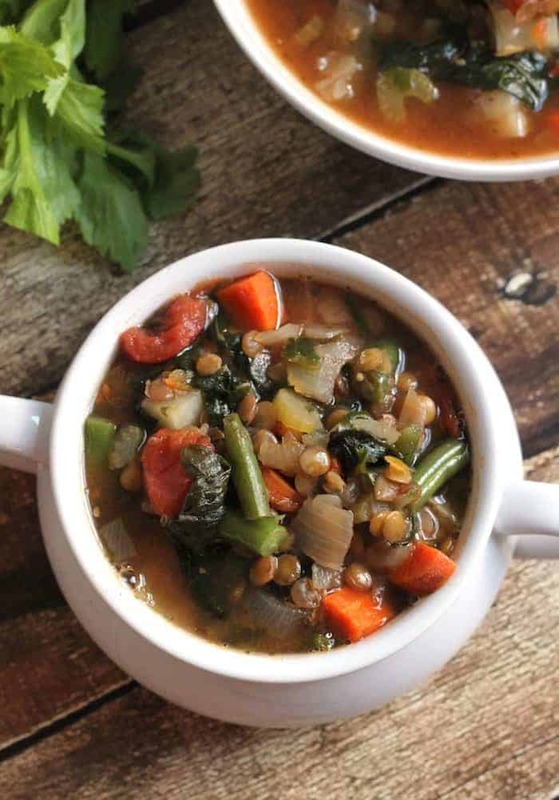 I’ve been looking for a good lentil and veggie soup, so I’ll have to give this a try! My mom always told me to pour salt or spices into my hand first and then into the pot – she says that it isn’t good for them to get too close to the heat and steam from the pot. I don’t always follow her rule (oops! ), but after hearing your cautionary tale, I’m realizing that pouring into your hand makes sense for a variety of reasons. That’s so sad about the ruined soup! I have low blood pressure. I shall polish off your soup. I can’t wait to make this but more importantly your soup bowls are adorable!! Where are they from?? :lol: I’m laughing -with- you, not at you :P If it makes you feel any better, I once dumped cumin into my oatmeal instead of cinnamon. I usually try to make the best of kitchen mishaps, but I couldn’t save that one. Eek. Lol. That happened to me the other day with pumpkin pie spice. I thought it had shaker thing on top but nope, just one big opening. Dumped like half the container in. I also forgot baking soda and powder in those muffins, so they were quite the experiment. Def need to try this soup once the temperatures are out of the mid 90s here in Austin. That totally stinks and yet I can relate a little too well. One time, my cat climbed into my cupboard and broke a brand new bottle of Costco sized olive oil. It spilled onto my counters and floors and I mopped up olive oil for hours that night and hours the next. Also, if I’m recalling it correctly, there was a lot of hysterical laughter and podcasts to accompany me. For the next week, whenever I stepped on the floor boards, olive oil would ooze out of the floor joints. Love the veggie soup. I’ve got a similar version coming next week. Great minds think alike, eh?! HA! I don’t mean to laugh, but I can totally picture that situation. That’s happened to me with crushed red pepper and another time with cinnamon- both of which you can KIND OF scoop out…. unlike salt! Photos are still gorgeous though! Alexis this soup is DELICIOUS! It was perfect timing, too…I was just thinking the day you posted it that I was craving something with lentils, and there it was! Thanks for always posting the best recipes!! You can come to my house and eat some with me, sans all the salt! Lol. I love how human and down to earth you always are…. I fixed this for dinner tonight, the whole family loved it. Thank you for sharing! Amazing! I’m so glad to hear that, Jami! I made this tonight, I followed the reciept , except for the Italian seasoning I used oregano instead. I added 1/2 bell pepper. I used the khnor veg. Broth concentrate and added the correct amount of water. Not sure what happened but mine did not taste so good. I did use fresh tomatoes,pealed and diced. Do you think it was the. Oregano? If so what can I add to it to improve the taste? I also added frozen sweet peas (my wife’s favorite) and I used kale instead of spinach. A very comforting, hearty soup for a rainy day here in SF. I really enjoyed this soup! I actually just put all the Ingredients in a crockpot for the day with some extra vegetable broth and turned out fantastic! 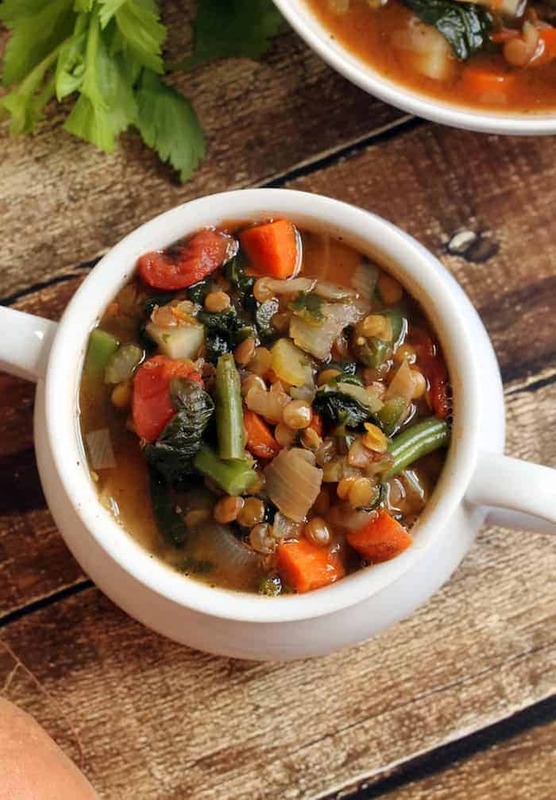 This is our favorite lentil soup!! It never disappoints and the broth is soo flavorful!! The Hubs normally doesn’t eat leftovers but he’s already dished himself up a serving to take for his lunch tomorrow lol!!! Am hoping there will be leftovers for me!!! I wanted to give it 5 stars but it wasn’t letting me!! I think it’s worth 10 stars!!! !